kiyoharu is back! 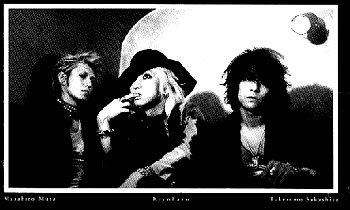 After kuroyume, kiyoharu formed Sads, with kiyoharu on vocal, Sakashita Taketomo on guitar and Muta Masahiro on drums. The original bassist left soon after their first tour in UK and they are now with a session bassist. I don't like him! Hitoki please come back! The music style of SADS is a little bit different from the late kuroyume, mainly of hard rock type instead of punk/grunge in late kuroyume. But I like it too! Drummer muta left SADS on 3.1 due to "difference in music style"! SADS is now looking for a new member and preparing for new recording. It is likely that Mitsuzono Eiji, a tour member of kuroyume and a present member of HITOKI-PIRANHAHEADS, will replace muta. Sads is releasing 2 videos on 2.28: live video "Conclusion of my BABYLON "The Revenge" 2000.12.7 Osaka HALL" and tour document video "Document of "Welcome to my BABYLON" tour THE INTRODUCTION 2000.8.5-2001.1.1". Kobayashi Masaru, the session bassist since "sky of forgetfulness", joined Sads as regular bassist on 00.12.7, announced during the live that night in Osaka HALL.